techstartNI are holding an Open Office session in Ormeau Business Park. 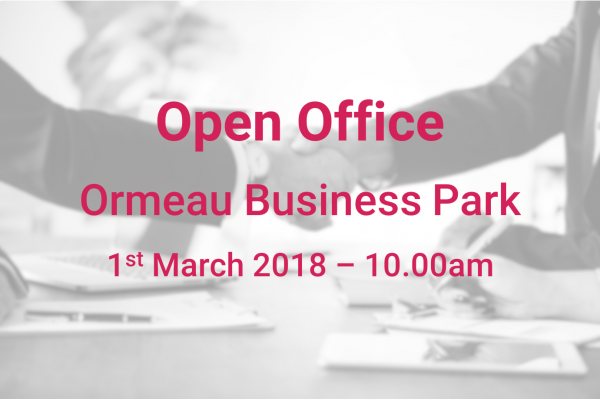 The Open Office gives entrepreneurs an opportunity to meet with the techstartNI team to explore the funding available and discuss their business ideas. techstartNI is dedicated to working with ambitious entrepreneurs in Northern Ireland through the provision of finance and advice. If you have just started working on an exciting project, or you’re already running a start-up you should meet with the team. techstartNI offer an integrated support programme of Equity Investment, Proof of Concept Grants and Investment Awareness workshops and events. A £17 million Small and Medium-sized Enterprise (SME) Equity Fund, providing initial investments of £50,000 to £250,000. Two University Funds of £1.5 million each, providing initial investments of £50,000 to £250,000 to University spin-outs. A £3.6 million Proof of Concept Grant Fund, providing grants of up to £25,000, on a competitive basis, to help commercialise Northern Ireland based innovation. An Investment Awareness Programme, providing support to entrepreneurs across the key business issues facing them as they endeavour to bring their business ideas to fruition. Meetings will be allocated on a first come first served basis, with a limited number of 30 minute slots available. Please include your name, contact details and a brief outline of your business or idea.